It’s September and National Yoga Month, so why not consider introducing your child (and perhaps even yourself) to yoga, its benefits and perhaps inspire yourself to create a more balanced lifestyle for yourself and family? I know you might be asking yourself, “Children’s Yoga? What’s next?” but I can tell you it’s not as crazy as it may seem. I can truly attest to the fact that yoga really resonates with children. They love the practice and they love how they feel afterwards. And the bonus is that a child who learns yoga and relaxation is developing beneficial skills they can use throughout their life. I was not surprised when I recently ran into Tim Rollins; the director of The Upper Valley Aquatic Center where I have been offering children’s yoga classes since the spring; and he told me that he had been skeptical when his staff had mentioned children’s yoga, but after seeing the classes in action, he had the following quote for me to share, "When I first heard about yoga for children, admittedly I was skeptical, but Geraldine has won me over with the fun, smiles and merits of Children's Yoga. Her energy, enthusiasm and professionalism make for a great experience. It is a great program." So, what goes into a class… first and foremost, it’s about FUN! This is not an adult yoga class where quiet and concentration is appreciated. In children’s yoga we sing, dance, tell and make up stories and play games all the while incorporating poses such as pretending to be trees (falling over we shout “timber”), or we can be a dog, wag our tails and bark or we could be learning about the power of our breath. Songs, chants and movement are all an important part of class, as this creates a whole mind/body experience. Partner or group poses are always a hit! With the younger children (ages 2-4) this is done with the parent or caregiver, with the children aged 5+ these poses are done with their peers and they help create a sense of community, working on building teamwork and cooperation skills. The class ends with some relaxation and visualization techniques. For the younger children, this is a relaxing time to just snuggle with their parent, sibling or caregiver; for the older children (5+) we help them to concentrate by guiding them through visual imagery or a story that in some way might relate to the theme of the day. 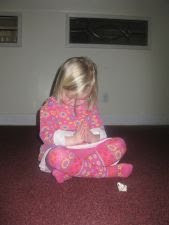 These quiet moments help children to develop self-awareness, problem solving skills and a sense of peaceful well-being. Terrill, a local mom of two girls aged 2 and 4 sums up the class really nicely as follows: "Yoga with Geraldine is one of my favorite kid’s activities in the Upper Valley. Geraldine is always patient and kind, and seems to really enjoy working with children. The class is a nice blend of stillness and activity. Among many other things, the kids pretend to be trees, rowboats, and fish. My favorite part of the class is when the kids all lie on their bellies and gaze silently at a candle flame for up to two minutes. This time to be quiet and still is so rare in kids' lives, and so important." What is really important to me in my class especially for the Yogi Tots (age 2-4) is that we let kids be kids. Children have their off moments or get distracted, sometimes have a meltdown and in yoga, that’s ok! In the 2-4 age class, the classes are most fun and effective when taught with a participating parent (or caregiver). The role of a parent in this class is to attend to the needs of the child, offer encouragement, and support/help with the poses and songs but most importantly HAVE FUN!! A parent’s participation provides a wonderful opportunity for parent/child bonding, and I try to include activities, songs, suggestions that can also be shared together at home! No previous yoga experience necessary! Geraldine is a certified Childlight children’s yoga instructor, and owner of “Yogi in Training”. Classes for children 2-4 with caregiver (Yogi Tots) and for children 5-8 years of age (Yogi Warriors) are available around the Upper Valley. For a full list of classes, days and dates, visit www.yogiintraining.com or email Geraldine@yogiintraining.com or find us on Facebook! Also available, “Yoga To Go” bringing yoga to preschools, elementary schools and other enrichment centers. Centers currently offering “Yogi in Training” include Woodstock Nursery School (Woodstock, VT), Watch Them Grow Preschool (Bradford, VT), Sugar Maple Preschool (Corinth, VT), Zack’s Place Enrichment Center (Woodstock, VT) and DHMC preschool(Lebanon, NH).